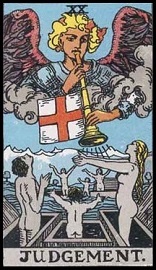 This Tarot card describes a cherub holding a trumpet on which a flag is hung. The little angel seems to be floating in the blue clouds and looking at the world of the living beings. From the sky are exuding beams of yellow and red that illuminate the earth. Judgement presents three individuals. The character in the middle stands backwards while a woman and a man stand by his side, praying. Judgement symbolized the idea of life and death and is a direct reference to the hereafter. It brings hope as it reminds human beings of the duality that exists between terrestrial life and God. Judgement brings a renewal. It indicates a mature and spiritual behaviour. It announces a new redeeming life and the development of spirituality. Often associated to a form of resurgence, Judgement brings a message of hope. With the High Priestess, Judgement can announce an upcoming birth. Judgement disappoints because of his incapacity to understand. Using unconscious and divine ideas, it is a dark card that can be the sign of hesitation or perversion. It can announce bad news that could bring destruction and deep disappointment. Without doubt you have managed to enter the phase of total renewal in your life. Both in your emotional and professional levels you have known how to get your act together and move forward. You do not think in the same way and you are now optimistic. Congratulations: the future is coming! You are easily influenced and it can be dangerous. You have the impression of controlling things but you are guided by people who play with you. You lack distance and persuade yourself about things that do not exist. Exterior events will disrupt your daily life and you will have trouble finding solutions. You will have to change the way you see things. You miss a lot of elements in your life and it cannot continue. Your entourage sees it and sends you signals - more or less clearly. You have to escape from it by reinventing certain aspects of your personality. You have to move forward. You will evolve positively these coming months. You have taken difficult decisions and you are in a positive cycle again. Your entourage has noticed these changes and lets you know about it. You can now start new projects that will be rewarded with successes. Judgement brings quick changes in your life. These changes will be welcomed and well accepted by you. On the professional level, it can be an unexpected transfer or an unexpected job offer. In your love life, you will meet new people that will surely move you deeply.